The vistas to be had here on this ridonkulously perfect day were equally as breathtaking as yesterday. You just don’t get much better days than this for being outdoors. I was able to walk out into the middle of the fall’s breastwork, the final brink before it plunged over a vertical drop of probably 50 feet. I lost track of Rutabaga for awhile, and went back to the massive cliff waterfall, where she turned up again to tell me that there was a way down the cliff face to get a better view of the falls. Danger you say? Yes please. This turned out not to be merely a case of danger for danger’s sake; it really was 100% worth it. I had to precariously lower myself down a near-vertical wall by using tree roots for handholds, clenching my camera in my teeth. …or phalluses I guess. You were thinking it. Sure enough, we were getting close to the ruins of the actual Hungarian Dam. There were so many excellent distractions out here that I had nearly forgotten that was the whole reason we had come. We continued hiking up around beyond the reservoir, because the map told of yet more waterfalls to be seen upriver from here. We stopped here to drop our backpacks and have lunch. The shallow waters glistened pleasantly in the warm summer sun as it ran over the ancient concrete. 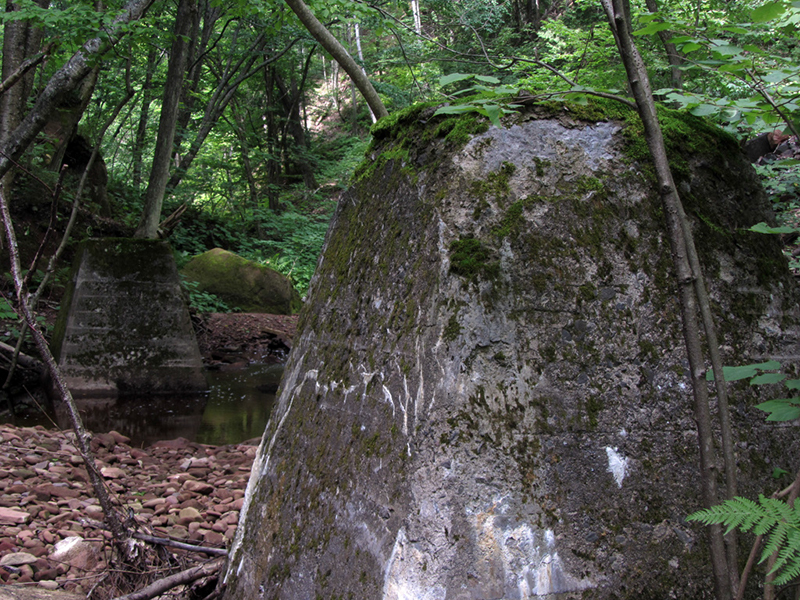 Before taking its tumultuous journey across the Keweenaw’s fractured spine, the Hungarian Creek begins its journey atop Dover Hill along the marshy lowlands surrounding the old Oneco Mine. Before its acquisition by the Oneco those lands were previously held by the Hungarian and Dover Mines, mines which both elected to adopt the creek as their own. The result was a Torch Lake tributary with an identity crisis – some maps label it as the Hungarian while others refer to it as the Dover. Locally it’s known as the Hungarian and is famous for the collection of rugged falls, which can be found along its length. But the river is home to more than just spectacular falls – it’s also home to a few ruins. As Torch Lake’s second largest tributary, the Hungarian Creek attracted a great deal of attention from mines planning to build mills on the lake. Perhaps more aptly described as a river, the waterway could provide large volumes of water during a good portion of the year. In fact, spring flooding along the Hungarian was all too familiar to the residents of Tamarack City, who had the misfortune of living along a sandy floodplain laid down by the creek hundreds of years ago. Mine companies knew that if the river could be tamed, it would become a valuable resource for any industrial complex built nearby. The first company to take advantage of this natural resource was the Tamarack, who built a long wooden launder down from the river to supply water to its new mill on Torch Lake. After the turn of the century the newly established Ahmeek Mine expanded on the Tamarack’s idea and built itself a 3 million gallon reservoir along the creek for its own mill – a dam that continues to stand still today. And that is of course the Hungarian Dam we see here, having been built almost exactly one century ago. Mike’s map indicated the presence of other ruins in this area, so we now sought them out. They were a few mere concrete foundations. The thinness of the foundation walls did not suggest they ever supported a very large structure. Whatever it was was fairly minor. As we continued on our way back toward the car, we opted to work our way down to the low road to experience the gorge from its secluded depths, as opposed to the airy, majestic highlands we had seen on the way in. Once down there, we decided that it would be fun to go hike back toward the two waterfalls with the ridiculously huge drops and see them from below. We first followed the stream up to the base of the chute we had seen the top of yesterday. The “waterfall” was actually a little too small for it, and was barely enough to moisten the rock before ever reaching the bottom. It was magnificently scenic to climb up however, though these photos do little to convey the true scale. At one point where the water recollected into an actual flow, I noticed a couple very old drill marks, making me wonder further about the history of this spot. We left our backpack behind to continue climbing. This is about as far as I made it up before it became too steep to bother continuing. Now we went back down to the confluence of the stream again, to round the tall stone corner and hike up to the main waterfall. There were no trails, so we had to scramble up over some areas right in the middle of the rushing water. Finally we made it to the base of this monstrous cataract, at what was probably the hottest part of the day (a sweltering 75F). We continued hiking downstream after spending several minutes here resting. Continuing downstream toward Tamarack City again, we began to find more of the old bridge ruins. Again, the existing bridge you see is the one that supports the current ORV trail, but whose piers originally supported the Copper Range RR line. Underneath the existing bridge, it looked like there were more, older ruins on the same spot. They in fact were the footings to the original Copper Range RR trestle in this same spot, which predated the larger rectangular piers. Dat CRT sleeps with da fishes, eh. I can only imagine what grave offense brought this gruesome fate upon it…perhaps it conked out during da Packers game? The supports were massive, and seemed to loom upward infinitely, as to look up meant losing them in the glare of the sun. We began climbing back up out of the gorge. This one belonged to the Calumet & Hecla RR, which not far away split off onto a spur that ran down to the shore of Torch Lake to service the Ahmeek Stamp Mill in Tamarack City. …but we were tired and hungry for lunch, so we didn’t investigate much further. We went back into Calumet in search of lunch.